Prime Minister Justin Trudeau stepped into Google Canada’s new Kitchener, Ont.-based office for a morning of playing with 3D printers, leading students on a virtual reality tour of Parliament Hill, playing video games, and even making allusions to his knowledge of coding in C++. “There is a question to how much people will tolerate a geek Prime Minister and I know I’m pushing those limits,” he said at the official opening to the renovated Breithaupt Block building. Shortly thereafter, he “cut the ribbon” of the new office by controlling a sprite through an on-screen maze, using four pads of Play-doh to manipulate it to the Google logo finish line. When he did, a stream of confetti exploded into the room. 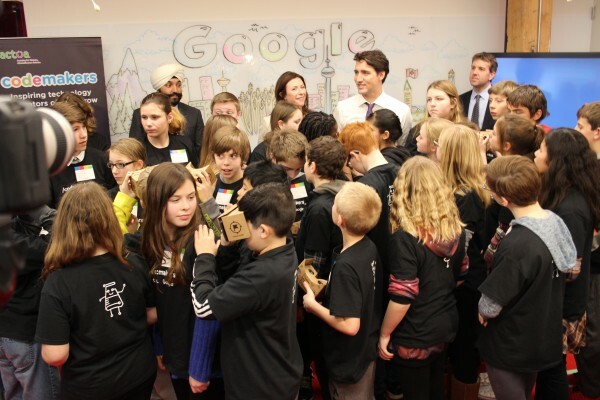 Prime Minister Justin Trudeau met with students involved in Codemakers, a program supported by Google. Google is moving from the Tannery, a hub housing multiple tech operations, and bringing its 350 engineers to work in the new 185,000 square-foot space. It’s three times the size of its old office and houses the teams that build software for a wide range of Google products – from Gmail’s mobile apps, to its OnHub router onboard software and apps, to the Chrome browser, Ads, and Google Fiber. With the Canadian dollar trading for less than $0.70 on the greenback and stock markets in decline since the beginning of the year, Trudeau acknowledged the country is facing some difficult economic times, but said his visit to the Kitchener-Waterloo region was about optimism. If the new Google office is a reflection of economic growth isn’t clear. In remarks to a roomful of Google engineers, media, and children on hand from the Codemakers program, Sam Sebastian, managing director of Google Canada, stopped short on putting a number to any hiring plans. Google has operated an office in Kitchener since 2005, he noted and has been long-time partners with non-profit tech hub Communitech and the University of Waterloo’s Velocity incubator program. About 60 per cent of the engineers working in the new HQ will be University of Waterloo alumni. Google operates four offices and have about 700 alumni in Canada. 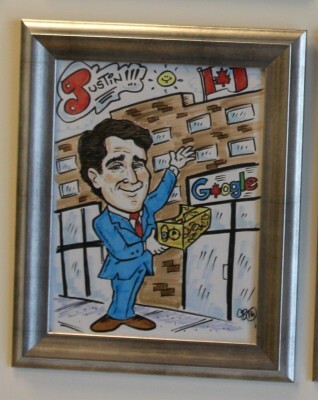 The event concluded with Trudeau being presented with a caricature of himself that will be hung on the wall of Google’s office, alongside other employees and honoured guests the company has hosted.